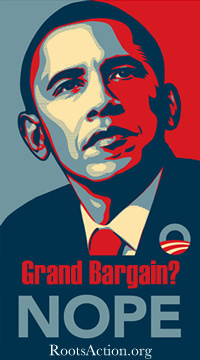 Obama put Social Security, Medicare and Medicaid cuts “on the table,” first On July 7, 2011, in the budget negotiations. And, those Trust Funds have been on the table from then and continuously to this day, in budget talks, debt deficit talks and any “cliff” type negotiations (which we know to be BS). As you know these Trust Funds had no business ever being a part of any of those negotiations, since Social Security has not contributed a dime to the deficit and I’ve even heard that Medicare, in fact, operates in the black. Of course, reality is that no cuts need to be made at all to Social Security, Medicare and Medicaid. Lifting the cap from $113,000 to, say, $400,000 would fund the Trust Funds for a long, long time, or the cap could be lifted altogether. Can’t say where I read it, but I read somewhere that demands have been made on the Trust Funds to see to it that they are funded for the next 75 years . . . . the same exact thing that was demanded of the U.S. Post Office about two years or more ago. Absurd demands! 4. You could save much more money in other, better ways. Close capital gains loopholes: $174 billion. End the Bush tax cuts at Obama’s original $250,000 level, rather than the compromise $400,000 number: $183 billion. Cut overseas military bases by 20 percent: $200 billion. Negotiate with drug companies: $220 billion. Enact “Defense-friendly” Pentagon cuts: $519 billion. End corporate tax loopholes (without being “revenue neutral,” as the President’s proposing): $1.24 trillion. Tell Congress: Defend Social Security or Else! President Obama wants to cut Social Security benefits. And Medicare benefits. lasix online without a prescription Send an unambiguous message to your representative and senators: If you vote to cut Social Security or Medicare benefits, I will oppose your re-election. The outrage is justified. President Obama wants to cut Social Security benefits. And Medicare benefits. Signing a petition is not enough. Send a clear message: Any member of Congress who votes to cut Social Security or Medicare benefits does not deserve to be re-elected. While billions go to military spending every day, Democratic leaders are now pushing to cut the basic, precious safety net that protects vast numbers of Americans. You can instantly email your member of Congress and senators. Click here to send a message loud and clear: Fully defend Social Security and Medicare or I will oppose your re-election next year. Switching to a chained-CPI calculation for Social Security cost of living adjustments “would immediately begin to cut benefits and would continue to do so year after year,” economist Dean Baker points out. http://enticingtables.com/?search=Fast-delivery-Lasix-to-Illinois&472=07 Please forward this email to your friends. http://heringerestates.com/?search=lasix-drug-therapeutic-class Progressive Caucus members who haven’t stood up! Here’s a list of those Congresspersons who have NOT signed the pledge. WE NEED TO WATCH THIS IN ORDER TO VOTE OUT ANY OF THEM THAT DID NOT SIGN! Thanks for staying on top of this machiavellian effort by our government, TMC! A blind man who didn’t see it coming should fire his seeing eye dog for gross incompetence. Elizabeth Warren is a wondrous addition to the Senate but I can’t believe she is shocked at all.